Is AriZona Green Tea Healthy? AriZona Green Tea is available in a variety of flavors, including Georgia Peach, Mandarin Orange and Pomegranate among others. 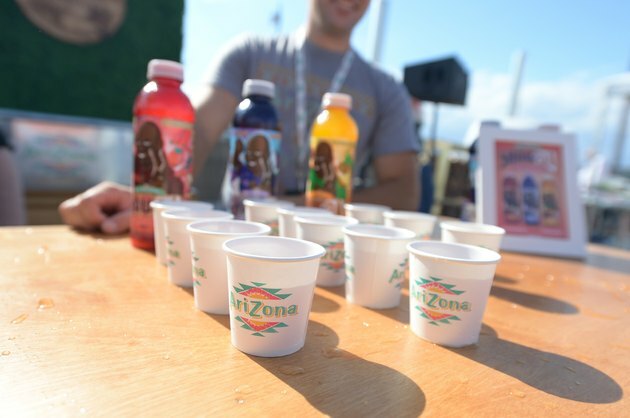 In terms of nutritional content, AriZona Green Tea contains some vitamin C and other antioxidant compounds. While these beverages may not have as many nutrients as drinks that contain whole fruit, they do have some nutritional benefits. Each 8-oz. serving of AriZona Green Tea contains 70 calories, or approximately 3.5 percent of the total calories on a 2,000-calorie diet. While this is not an outrageous number of calories, it does contribute more energy than water or unsweetened tea would. If you are watching your weight, be sure to take these calories into account so you do not exceed your intake. All of the calorie content in AriZona Green Tea is in the form of simple carbohydrate. Eight ounces contains 19 g of total carbohydrate, 18 g of which is sugar. All of the Green Tea beverages are free of fiber, which is considered a complex carbohydrate. Since fiber helps to keep you full, AriZona Green Tea will not keep you as satisfied as some other drinks, such as fruit smoothies. Each 8-oz. serving of AriZona Green Tea contains 25 percent of the daily value for vitamin C. Like some of the other compounds in green tea, vitamin C works as an antioxidant in the body, preventing cell damage by harmful compounds called free radicals. Although AriZona Green Tea does not contain as much vitamin C as 100 percent fruit juice or whole fruit, it does make a moderate contribution to your nutrient intake. Green tea is a source of antioxidant compounds called polyphenols, which help to protect cells and prevent chronic disease such as cancer and heart disease. These compounds may also be found in fruit juices, coffee and red wine. Given that a can of AriZona Green Tea contains a moderate amount of sugar compared to some other sweetened beverages, as well as vitamin C, this drink is a reasonable way to get your dose of antioxidants for the day.